For a few years now, I've been purposefully avoiding vampire novels. (Thank you, Stephenie Meyer.) I can't say what drew me to pick up Glass Houses (again -- I owned it for a little while) only that I needed a spot filled on my reading queue. 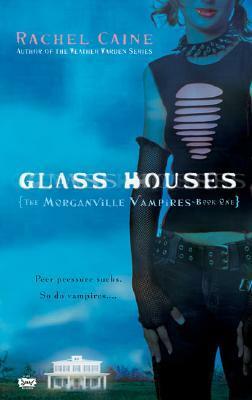 Glass Houses didn't quite meet my expectations with its superficiality, "bubble gum" type story, and while the characters were diverse and surprisingly well-rounded, I didn't connect with any of them, least of all the main character, Claire. Finally, the plot left me struggling for a sense of fluidity. Overall, while it wasn't a cringe-worthy read, it wasn't enough to reduce me to a fan-girly mess, either. There was something about this story that I couldn't take seriously. I felt like there was too much contrast between the styles of the writing and the story. The story held a dark edge, but the writing didn't reflect that. The writing was a bland, slightly sarcastic style of prose that ruined the dark suspense of the story, making it coming off more as a spoof or a parody to me. There just wasn't a lot of depth to make it seem legit. The characters were well done, though. I liked how the three other members of the Glass House each had their own style but worked well as a cohesive unit of friends. The only issue I had was with Claire. Oh, Claire, darlin... When the action starts, just go take a powder, okay? If she wasn't screaming, then she was crying, and if she wasn't crying, she was fainting. Not necessarily in that order. And while she was supposed to be this incredibly super demon baby smart, I was just like, "Really?" I ended up shaking my head at half the stunts she pulled. Not that those stunts didn't inspire some pretty awesome action scenes. (We'll ignore how stupid half the stuff Claire did happened to be.) The ending was like the climax to a movie with people running, windows smashing, guys flying through the air, propelled by a pissed off ghost, and other supernatural drama. Not to mention, Rachel Caine left it on one epic cliffhanger. I did have a problem with how several of the scenes seemed to be completely random, leaving me wondering why I just spent ten minutes of my life reading that chapter. However, I have to give Rachel Caine props for her wicked humor. I love to laugh, and I love characters who can make me laugh. So a lot of the time, when Claire wasn't getting hammered by a pasty girl in heels, I was belly-laughing at Shane's quips or Eve's insightful life views. Even though the story lacked in a lot of other, critical places, it was entertaining. After thinking back on Glass Houses, I think I shall continue with the series. At least if I get hooked, I have the pleasure of knowing there are fourteen other books (so far) to look forward to. "Damn, Claire. Warn a guy before you do a face-plant on the floor next time. I could have looked all heroic and caught you or something." "Hell," Shane spit in disgust. "I can't hit a girl. Here, Claire. You hit her." He tossed her the bat.